But this post is not about the movie. It is about my own little breakfast club. Let me set this up. I have mentioned many times that I love social media because it affords me the opportunity to keep in touch with many of my former students. I have written blog posts about some, gone to lunch with some, photographed engagement sessions, weddings, maternity and family sessions with some. Two of my former students have even served as 2nd shooters for me at weddings. The beautiful thing about keeping in touch with them is seeing what fine, young adults they have become. It is truly a treat. Back in the days before I switched to teaching photography, I taught Art 1-2. Vivian took my class as a freshman. I have a prime directive for my students, which is “make me look like I know what I am doing.” Vivian did a fantastic job at completing that prime directive. Vivian came to my class with an amazing talent for art and a great work ethic. As a teacher, when you get a super talented student such as Vivian, you feed them knowledge, nurture them, let them grow, and if need be, stay out of their way. In addition to her art skills, Vivian was also a top musician in the band and orchestra and an outstanding student, serving as the president of the National Honors Society her senior year. After graduation, Vivian pursued her passion and her dream and packed herself off to art college. Once she finished with school, she stayed in Los Angeles and became a freelance artist as well as working for a couple of companies. She is currently employed by Nickelodeon as am artist/designer. After a several years, Steve, her faculty adviser for NHS, alerted me that Vivian had a blog and a website. I started to casually follow her on these sites, extremely impressed with how much she had grown as an artist and enjoyed seeing the work she was doing for herself and her employers. That eventually led me to connect with her on Facebook. 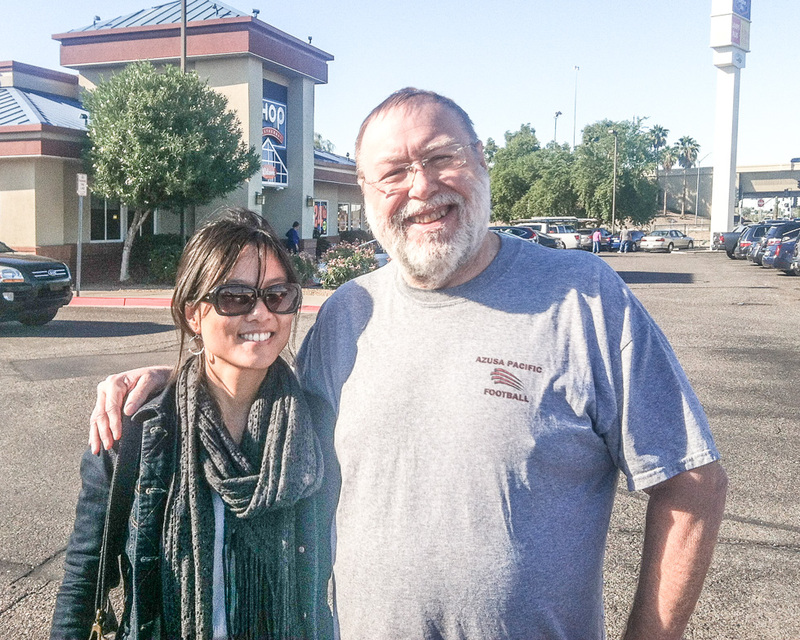 Three years ago, Steve contacted me and told me that Vivian was coming to Phoenix to visit her family. He proposed meeting her for breakfast during this time. So we met, becoming our own little “breakfast club” with Ruben, her English teacher, and Barb, her art teacher for her last 3 years of high school, and of course Vivian. Imagine a typical down home talk fest, and that is what our table becomes for the next two hours or so. 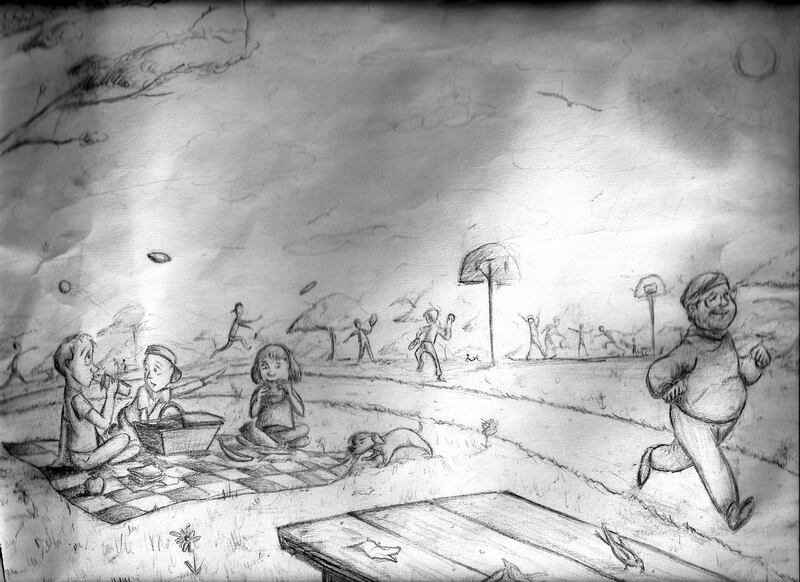 As a freshman, Vivian did lots of sketches on her own time. She liked to include some of her teachers in these sketches and then give those drawings to her teachers. Over my years of teaching, all such mementos from students were thrown into a box marked “why I teach.” Here are a couple of of works from Vivian’s freshman year. As you can see, there are drawbacks to throwing artwork into a box for several years. 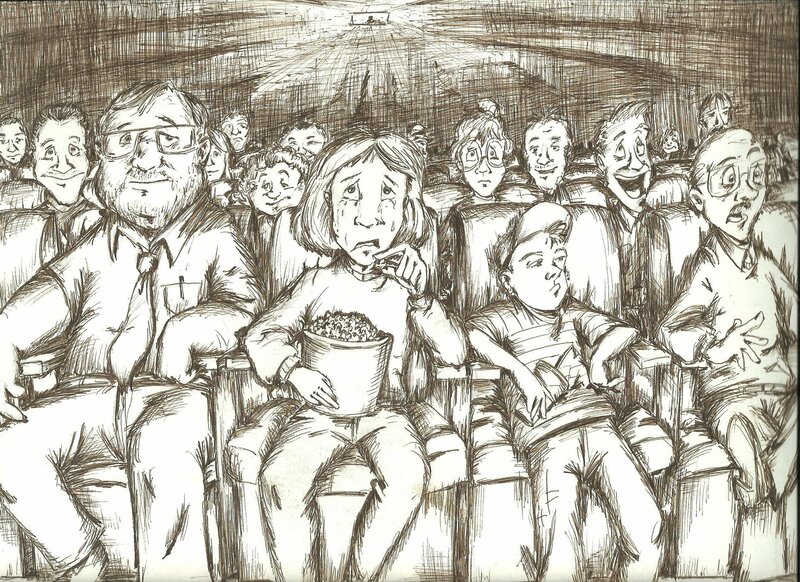 However, notice the detail she included in this drawing. Yes, that is me on the jogging trail. This is perhaps the only image of me ever jogging. Every face in this picture has a different expression. Vivian captured my slightly amused smirk very well. 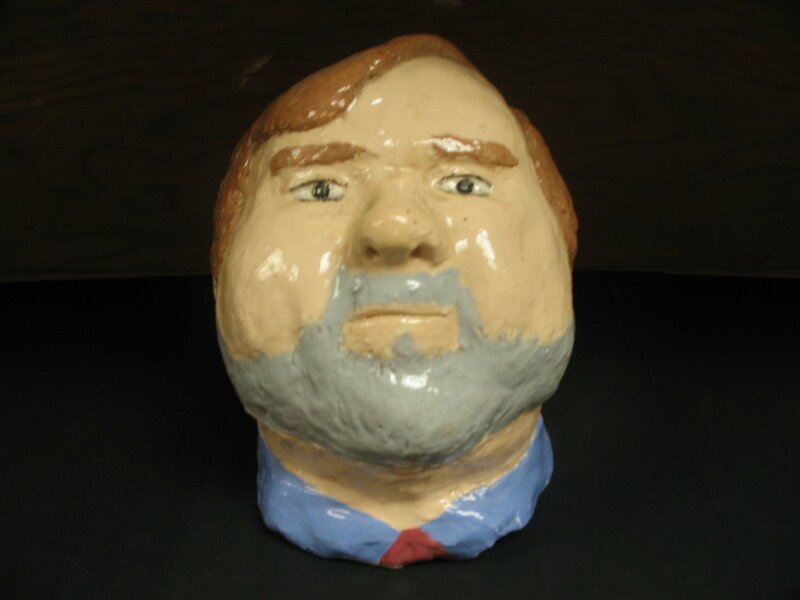 I kept this bust in my classroom until I retired. Students would always say “That looks like you. Is that you?” This bust currently sits on my bookcase in my home office…right next to the lava lamp. I highly recommend that you check out these links to see more of this outstanding young artist’s work: Facebook here and website here. And Vivian, thanks for taking a little time away from your family and meeting up with us. I look forward to your next visit. Happy Holidays. Mr. Poole, I’m left pretty speechless and very moved by all your kind words…thank you so much for this incredibly sweet and generous post. I don’t say it enough, but I’m forever grateful for teachers like you. Especially when it comes to art…you and Mrs. Dahlstedt have been there from the get-go and have inspired your students – in our work and in our lives. It wouldn’t be the same without you. I’m very happy we’ve been in touch, to know you’re happy and doing well, and look forward to more Breakfast Club gatherings 🙂 I’ll be following more of your work. Thank you again & happy holidays to you and your loved ones! Thanks for the kind words. I am glad you like the post. I am glad you had a safe trip back. Look forward to your next trip back here.